Hi everyone! Sorry this tuesday tip is going up so late, but it is literally one of the easiest things (set of things?) 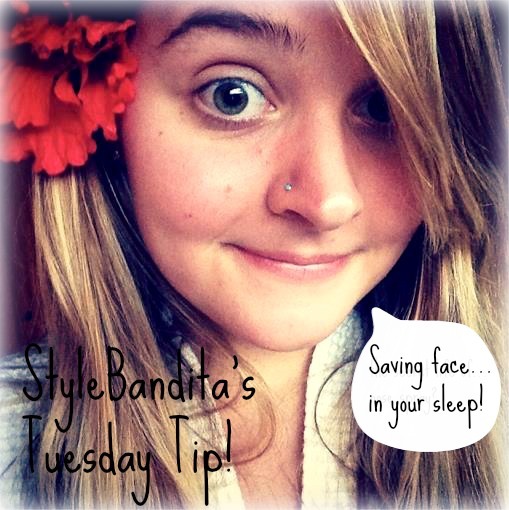 you can do before bed to help save your skin! First, get your fancy self some fancy silk or satin sheets. The reason for this is because silk and satin are so smooth that they actually won’t create any wrinkles or creases on your face if you’re a side-sleeper like me. I’ve been trying to sleep on my back because it’s better for toxin drainage (what a gross word) and redness, but I’ve always been a side-sleeper, I just can’t stay away. Anyway, those creases from pillowcases can lead to wrinkles, so make the switch to silky smooth fabric! Fellas, that applies to you too. Lastly, (this one’s just for the ladies, or fellas with long hair) toss your hair up in a bun before bedtime. Like I said up there ^ all the nasties accumulate in our hair throughout the day, so a day without a shower should = a night sleeping with a bun. Aw, now I’m imagining snuggling with a bunch of bunnies….